Miss Belle ticked off her first recipe from the Primrose Bakery Cup Cake Book, malted and oh so sweet, my teeth are still on edge. The boys have finished the k-nex rollercoaster and baby slept all through. I have had it in mind for a while to make some new cushion covers and these are from a few old coats, backed by a bright orange Alexon pure wool cape from the seventies, another job ticked off the list. My assistant produced the New Years eve dinner, yet another ticked off. No snow just frost but they were determined to get out and make something, after much discussion M+D=Smiley face, translates into Mummy plus Daddy equals Happy! Nigella's Yule Log made by Louis - cut into before I remembered a photo - way way too sweet but they both love it, couldn't find a robin so had to make do with a set of penguins! At last, Mrs Gaugain's Spider Pattern Large Rectangle from Victorian Lace Today. Geen merino/silk Mayfly Cobweb Lace in colourway Grass from KraftyKoala, the grey is also a merino/silk - label lost for the moment - both bought from Woolfest this year to satisfy my lace addiction. Worn for the first time today, don't think I have ever taken so much time over a project of any kind. The mathematics stumped me for a while, I made it wider than the pattern and I didn't have enough grey to work all of the repeats which wasn't a problem until I came to do the edging which needed not only to turn the corner with a point but also have a symetrical sides. After a short stay in the bottom of my knitting basket - the shawl not me - a clear head and a lot of pattern mapping sorted it out, it's not perfect but then what is! A week into our christmas holidays and the only snowflakes so far are of the biscuit variety. The preparations are done, we are just waiting for him to arrive! 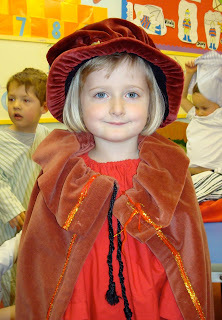 The Wisewoman went to the nativity. The photoshopped class christmas presents have been despatched. Nigella's Cranberry jam has been made. Victorian lace is at last off the needles, cast-on in August it was abandoned due to a mathematical disagreement which has since been resolved. The christmas fair has come and gone, Miss Belle and I managed to knock up 'Pin the nose on the Reindeer' from a bit of old blanket. The boy has been in the kitchen making some very chocolate heavy brownies from Ottolenghi.